Times like these when I couldn’t go to church isn’t easy for me. Nate has been sick for quite a few days now and things haven’t been so easy for all of us here at home. He wouldn’t eat, he’s coughing and it seems like the medicine is working but it’s taking a very long time to heal and Nate is in pain. He is always disturbed during sleep because of coughing. Most of the time, I really get so frustrated and I don’t know what to do. I become really sad for my son, I’d pity myself for lack of sleep which makes me palpitate sometimes at work. It pains to see your child sick. It makes you wish you could easily take that illness away and pass it on to you, but unfortunately, that’s just not how it works. Weather is one of the causes why children are having coughs nowadays. It gets super hot during daytime but on the other hand, super cold at night. Most kids in the neighborhood are getting sick and Nate isn’t an exception. Oh, the pain of seeing your child suffer is unbearable. I wish that he’ll get well soon, and I too, can rest peacefully, when his appetite is back. On the other hand, my lola, who’s 89 years old, was also recently admitted at the hospital in Tagum City for the same reason. We’re all praying for her healing as well. During the times when I get really down because of the things that are happening to me or my family, I know I can always get a wonderful reminder from the word of God. His word in Lamentations say that if not because of His great love and compassion, we are consumed. We are safe and kicking because of the air we breath, that’s from God. It is His compassion that keeps us alive. 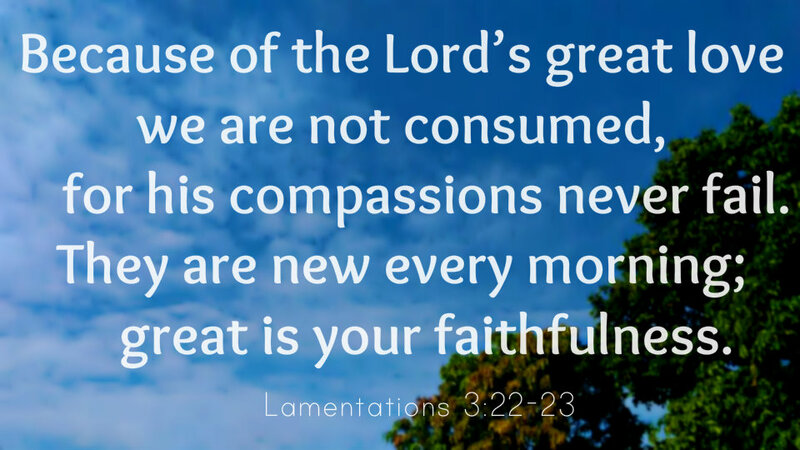 And His compassion are renewed everyday; they are new every morning, great is God’s faithfulness to us. So, I won’t worry, I won’t be sad anymore. I know Nate will be healed in God’s time, through God’s grace and faithfulness. The medicines he’s taking are nothing but tools to help him well. I rely on God for complete healing. It’s sad that we’re here, staying at home and not at the church to worship, but we need to do this for Nate to completely heal. Have a blessed Sunday to all!